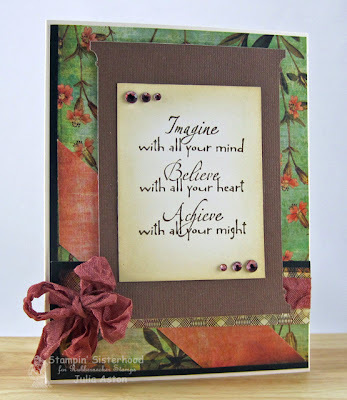 Today I'm sharing a card I made for the Inspiration Challenge over on Splitcoaststampers. 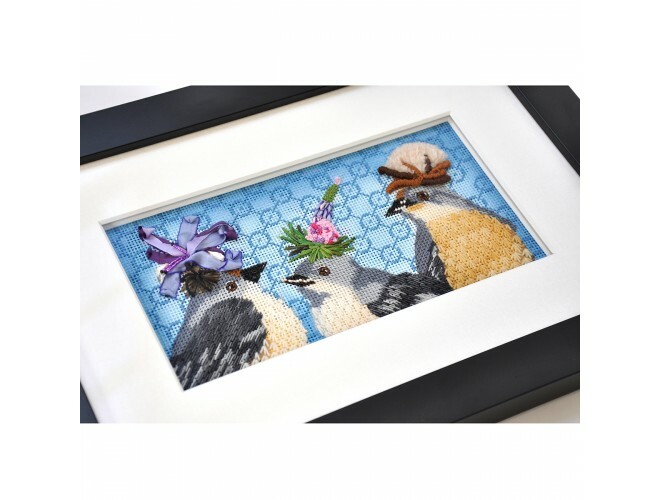 Brenda asked us to look at Needlepoint.com for inspiration. 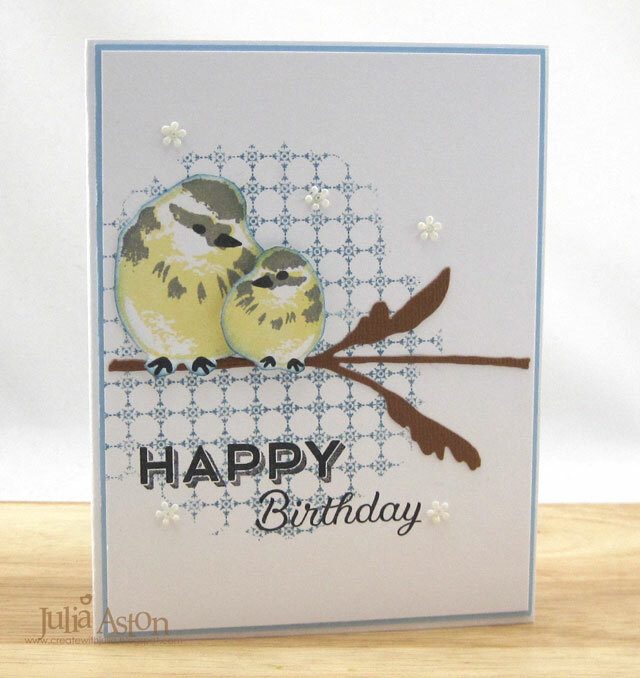 I was inspired by this cute Baby Mockingbirds piece. 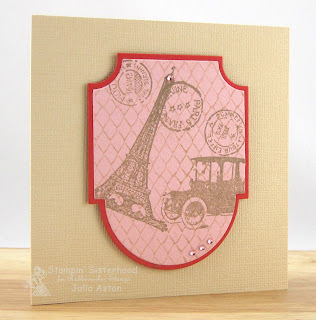 I used this weeks Sketch Challenge over at Splitcoaststampers for my design. I couldn't remember if I had a branch die anywhere in my craft room - so instead of taking hours to look (!) I came upon this leafed stem die from Tim Holtz Flower Garden die set and just turned it on it's side! For the background stamping, I die cut a big circle and used the negative piece as a mask over the panel and then stamped this lovely Ornate Background stamp from Wendy Vecchi (I love this stamp!). I made this card for two challenges - the sketch challenge over at Split Coast and this week's Color Throwdown. I stamped a collage of images over a stamped wire grid background - all my stamps are from Rubbernecker I popped up the layered mat stacks on foam tape and added some Tiny Twinkles for a little glitter! 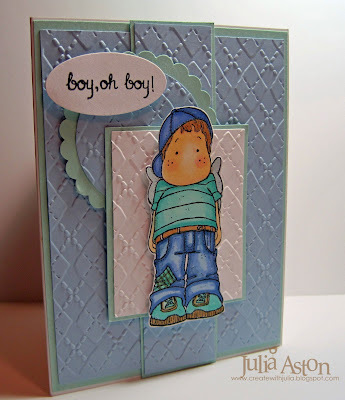 My second card was made for this weeks Split Coast Color Challenge - Night of Navy, Bashful Blue and Crumb Cake. 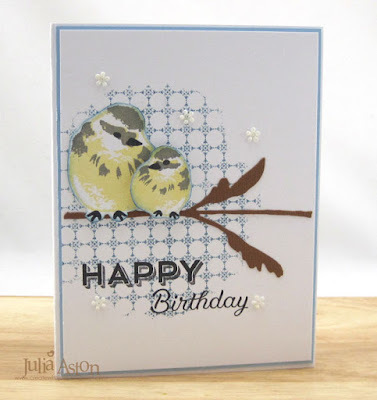 I'll be back on Friday with my WMS Blog Party card - hope you're joining in and that you'll stop by to see my card! I used the sketch from today's Split Coast challenge. I really don't like diagonal lines but I got it in there on my card! This wonderful sentiment is from Rubbernecker. I stamped the sentiment on a vintage cream panel, sponged the edges with Antique Linen and adhered it over the Grand Madison Window die cut. I adhered the window frame to the card with foam tape. Just watched CSI while I was posting this - and then some of the news - so got to go - it's late and morning comes early!! Hi stamping friends! How's your week going so far??? I've been very busy at work as our manager left and so we are all hustling to get the work done until they hire a replacement - I'm so glad to get home, relax and stamp! This month our Claire is sponsoring Jen Del Muro's October Sketch for You to Try so I just had to join in! 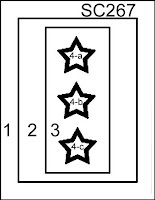 and of course I had to use Waltzingmouse Stamps! Check it out - it's a really fun sketch! In case you cannot read the poem - it says " I hear that you've been playing tricks, so listen, here's the scoop - I'm running short on candy treats, and this year it's Bat Poop! This poem is free at the Waltzingmouse Store so go grab yourself one and get cracking on your Halloween treats and cards! The bat stamp is from the Cicely at Halloween set and my papers are from a fun Ghosts & Goblins Mat Stack by Die Cuts With a View (DCWV) that I picked up at Joann's the other day. I used three different papers from the stack on my card. I printed the poem on card stock, cut it out and stamped the bat on the bottom. 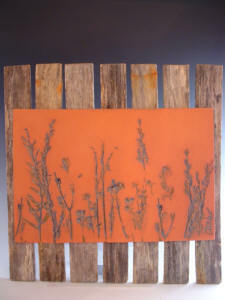 Then I sponged the edges with both Dried Marigold and Mustard Seed Ranger Distress Inks. 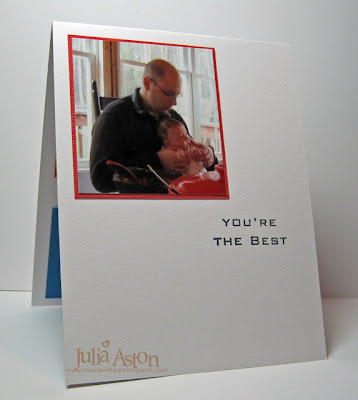 I layered the image to a slightly larger black panel and adhered it to the card with foam tape. Then I just added some rhinestones for some sparkle! 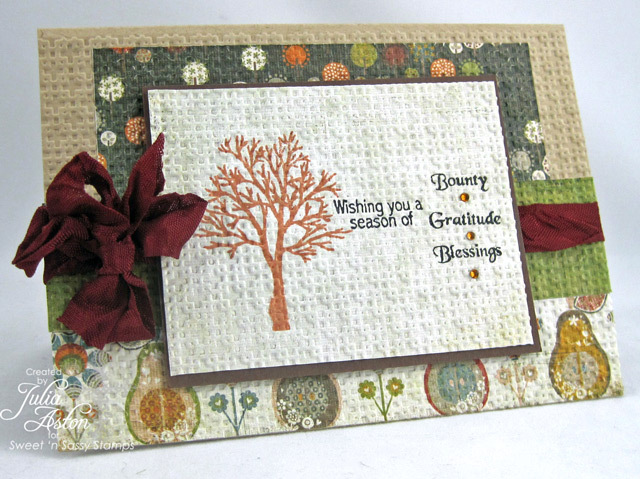 Thanks for stopping by today - and just so you know - Claire has decided to do a release this month of some wonderful Christmas/Winter stamp sets - the DT will be starting our previews on October 12th and the release will be October 15th so I hope you will come by. 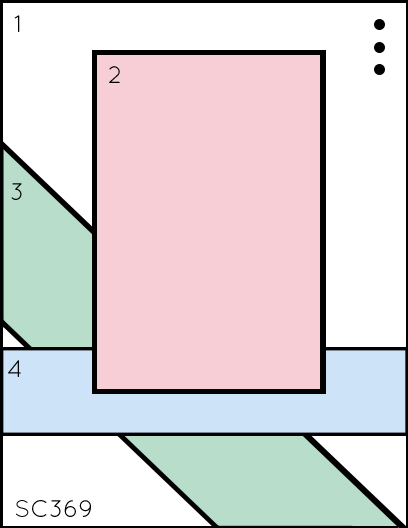 AND - something very special is happening for three days in blog land Oct 10th - 12th. I'll be participating on the 10th so please stop by then too!! Stamps: Waltzingmouse - free digital poem, bat from Cicely at Halloween set. Three Sweet 'n Sassy for Summer! My first card was made for last week's color challenge - Peggy gave us a monochromatic pallet of pinks - Pink Pirouette, Melon Mambo and Regal Rose. I didn't have all the SU colors so I improvised using 3 shades of pink that I had! I paper pieced the shells, cutting them out and popping them up on the sentiment circle with foam tape. The stamps are from Beauty by the Sea. 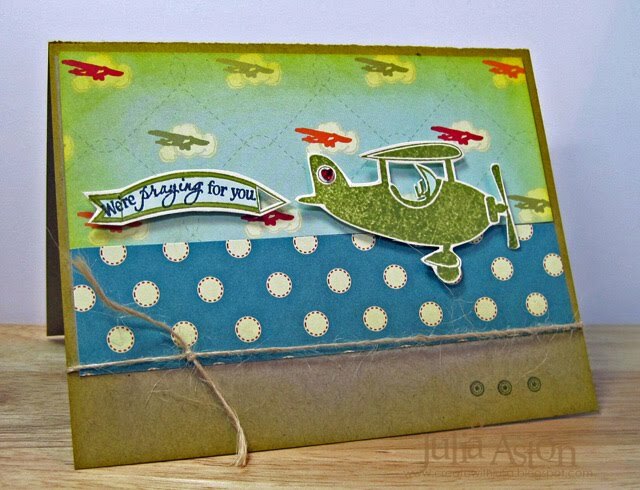 My second card was made for Sunday's Featured stamper who was StamperCamper. I loved the wonderful coloring on the sun on her Sail Away card . 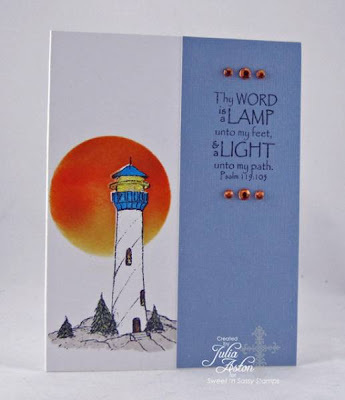 I used a lighthouse instead of a sailboat and added the sentiment and rhinestones on my card. 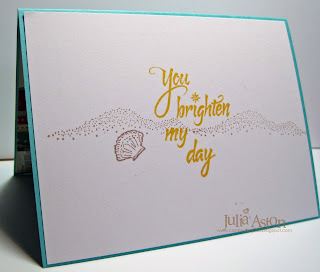 And finally - I made this beach card for the SCS sketch challenge - which Korin - owner of Sweet n' Sassy Stamps - hosted this week. I colored the image with Copics, cut it out a little outside the edges and adhered it to the patterned paper panel with foam tape. The sweet little mice building the sandcastle is a digi image called Cocoa and Cookie's Sand Castle and the sentiment is from the Beauty by the Sea stamp set. I suddenly feel like taking a drive to the ocean and smelling that sweet salt air - do you??!!! I'm lucky enough to live about 5 miles away from the Atlantic Ocean on the northeast coast of the USA so I could hop in my car and go! - well - if I'm not at work or stamping that is.... !! Accessories: foam tape, Copics - E33, E34, E31, E93, R05, R20, BV08, N2, YR23, wrinkled seam tape, adhesive gems - K& CO. I made this card for a combination of last week's Teapot Tuesday Challenge and the sketch challenge on Split Coast. The teapot destination (where we can send our card if we choose to) is Sean, a 23 year old diagnosed with cancer and going through some pretty radical treatment - one of his hobbies is model airplanes that fly - so this plane is flying by with a prayer for him and will hopefully bring a smile to his face! 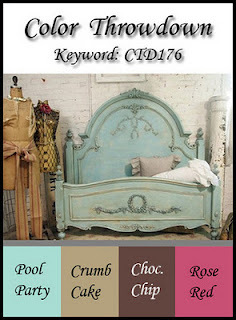 Hope to see you tomorrow for the friends of Waltzingmouse Blog Waltz over in the forum! We're using buttons on our cards! You can check out all the deets here. Don't Grow Up Too Quickly! 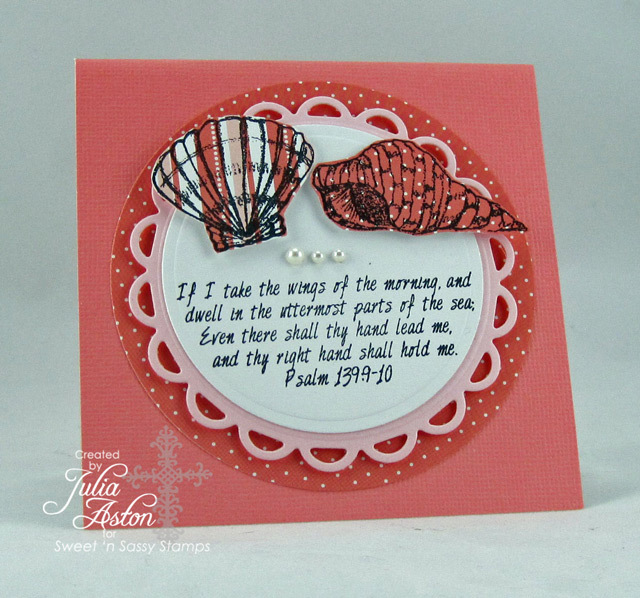 What a great CAS sketch over at Split Coast this week - oddly enough - I made a CAS card with it!! 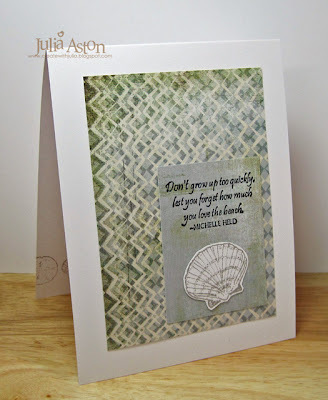 I just love my new Gina K 'Gifts From the Sea' Stamp set! It has such wonderful sentiments in it as well as lots of different shell and star fish stamps. 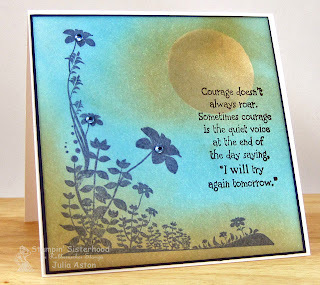 I found out about this set on my good stamping friend, Vicki's blog ,where she used this sentiment on her cute crabby card! I have several friends who love the ocean ( I mean REALLY love the ocean! ), so I'm sure to get a lot of use out of this set. 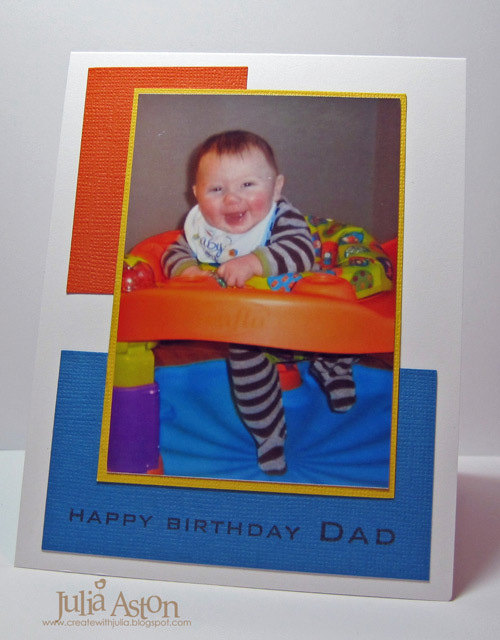 This card will be going postal to one of them for their birthday in May. The sentiment says "Don't grow up too quickly, lest you forget how much you love the beach." Inside I stamped 'Happy Birthday' which is another stamp in this versatile set! I normally would have popped this pretty shell up on foam tape - but I'm really trying to keep my cards 'flat' when I know I'm mailing them to avoid extra postage! Thanks for coming by today - I'll be back on Saturday with my Waltzingmouse Sketch card! I used Wednesday's SCS sketch to create a birthday card I needed for my niece Katie's husband whose birthday is today! 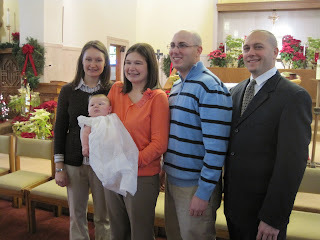 They are the parents of my dear grand nephew, Landon, who is now 4 months old - so this is Greg's first birthday as a DAD! I thought it would be fun to send him a card as if it was from Landon himself so I wrote a little note from Landon inside saying how he skyped me when they weren't looking to ask me to make the card for him! I kept the sketch clean and simple with this adorable photo of Landon front and center. I used bright colors for the panels to match those of the colorful play seat Landon is having so much fun in! On the inside I put another picture of Landon with his Dad from Thanksgiving -as well as another sentiment. 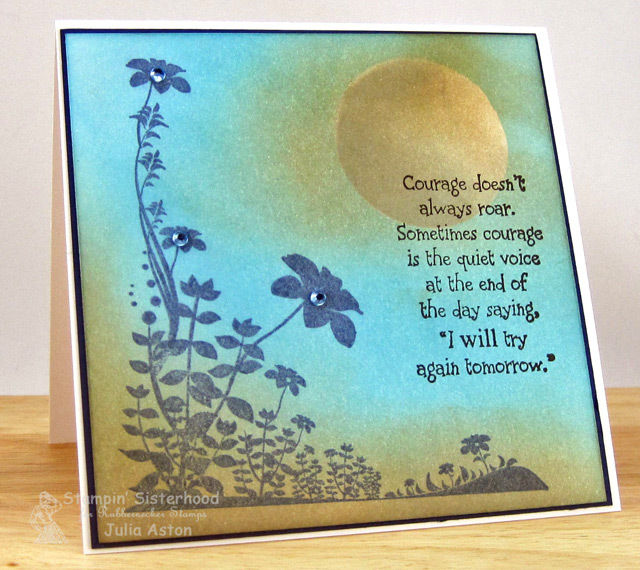 The sentiments are from the Free Spirit Sentiments set by Waltzingmouse. 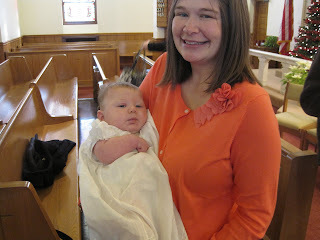 Gosh, I just love this kid to pieces!!! Tomorrow I'll be back posting some fun scrapbook pages of Landon as part of Day #2 of the Waltzingmouse 3 day Spellbinders Grand Calibur blitz! Day #1 is today and some of the other WMS DT are posting - Check out all the details on the WMS blog - there are prizes to be won!! Hello dear friends!! I was home from work last Wednesday because we had a blizzard with over a foot fallen (as well as many tree branches because it was a wet heavy snow!) - and so I got to stamp! I gold embossed my Bed of Roses stamp by Rubbernecker on the framed panel. I made my flowers from mulberry paper - cutting a circle into a swirl and rolling it up starting at the outside edge. 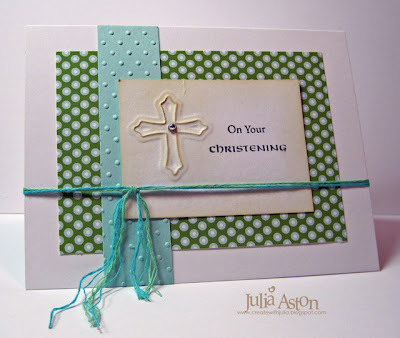 Then I cut my sentiment with a scalloped Nestie tag adhereing it with foam tape and added a ribbon. I sponged the edges of both the embossed panel and the tag with Antique Linen Distress ink. This card will be going to Katie Renz who was the Destination Station for the Teapot challenge - you can see her story here. 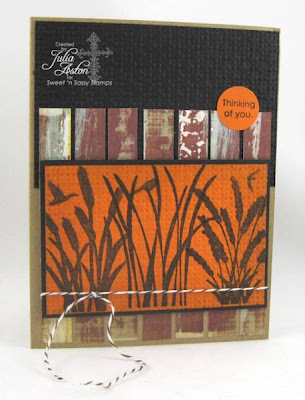 You can also find details on purchasing a great combination of digital stamps with proceeds benefiting Katie on Jak Heath's Blog post here. Here's my card for today's sketch challenge over at Split Coast. 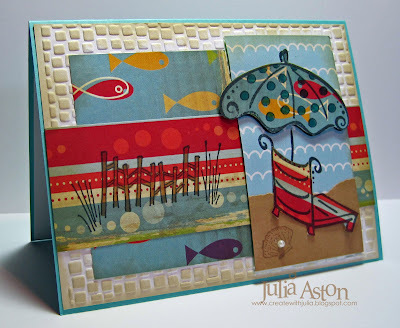 I made mine a summer fun card with this cute beach chair and umbrella, beach fence and shell stamps all from Rubbernecker . I paper pieced the umbrella and chair, popping the umbrella up on foam dimensionals. Just for fun, I added a little pearl to the clam shell stamping! Inside I stamped the small sand dune twice, another shell and this sentiment on a white panel. Exciting news: This weekend I'm going to be helping Dave (owner of Rubbernecker) run his booth at the Heirloom's West Springfield, MA Rubber Stamp and Paper Arts Festival!! Whoo hoo!! If you are in the area come on over and visit me at the Rubbernecker booth! I'd LOVE to meet you! It's sure to be a fun time - there are over 40 companies with booths and they are also running fun 'make and takes'!! Check out the program here. Also - did you notice the little cat on my side bar??? I've been invited to be on Marks Finest Papers Speedy the Cat's Friends Challenge DT for June, July and August!!! They have a fun challenge every Saturday and if you link your card to the challenge blog you could win a free MFP Stamp set every week!! So please check back here on Saturday!! My card today uses the sketch from Split Coast this week and is also for da Mudder's Teaparty. The story this week is that we're going over to London for the premier of Johnny Depp as the Madd Hatter! whoo hoo!!! We are going to infiltrate the crowd to help protect him and we need to blend in - so I'm coming to the party with my cute little bunnies tucked inside their basket - they'll sit in the market place with their "4 sale sign" all the time peeking out and monitoring the crowd - their long ears are actually radio antenae that connect directly to Tea-gan the head of security for Johnny! My cute bunny basket is by Rubbernecker Stamps that I colored with Copics. I used the new digi papers from Waltzingmouse for my panels. 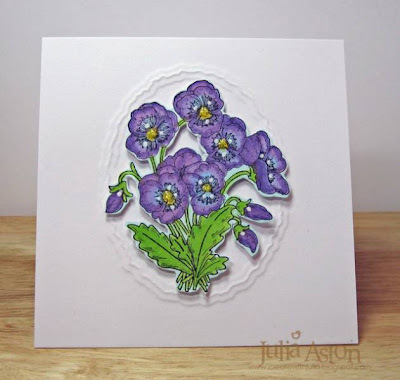 Just a reminder: This month there's another way to win a Waltzingmouse stamp set - check out the WMS sponsored color challenge at Stamping Around - add your card to Mr Linky over there for a chance to win Spring Baskets!! whoo hoo!! 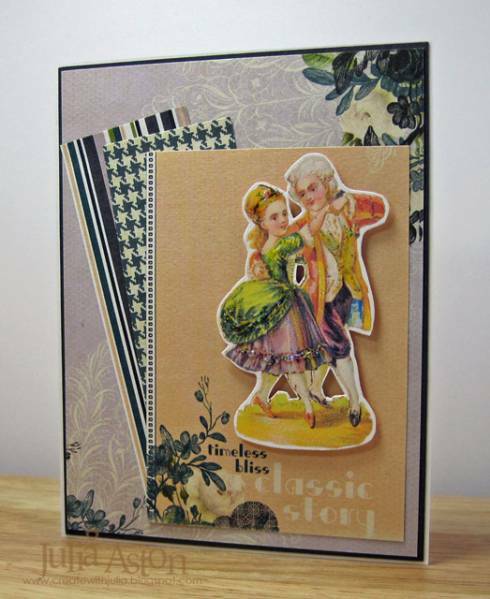 Also - be sure to check out the winners of the WMS stamp sets from our blog hop on Monday over at Claire's blog! WMS March 1 Sneak Peek! 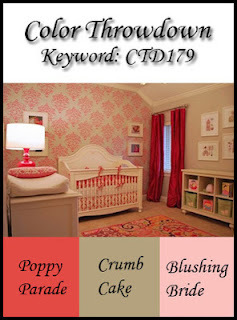 Can you believe it's already time for more Sneak Peeks from Waltzingmouse?!? 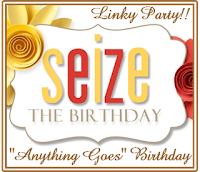 Claire has 3 delicious sets coming out on March 1 - Labels Three that I'm previewing here today - and Roses that Lisa is previewing over on her blog. The 3rd set is a cute Easter Egg set. Claire will also be previewing the sets so be sure to check it all out! The Labels Three set comes with 7 different labels that fit the Labels Three Nestabilities - how great is that! They, of course, can also be cut out by hand very easily too!! I used this particular label on my card because of the circles in the corners that went perfectly with the Cosmo Cricket DP. I colored in the circles as well as the edges of the label with my gold Spica pen. 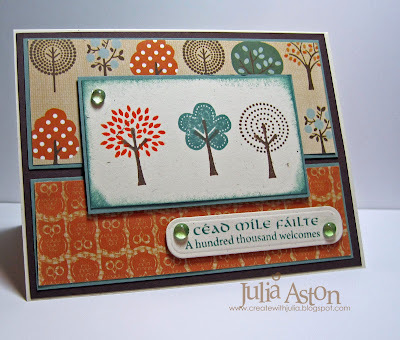 I stamped and cut out the shamrock from Celtic Heritage and colored the stem and edges of that with the Spica too. It adds some pretty shimmer IRL. The sketch is Karen Giron's Sweet Sunday Sketch. Click on my card to see better detail on the label. 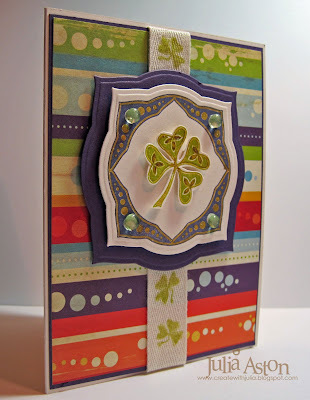 I stamped the twill tape with a small shamrock from Irish Blessings. 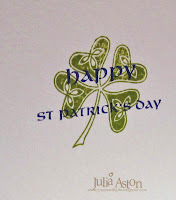 On the inside of my card I stamped the large shamrock again and over stamped the sentiment in eggplant ink. The WMS design team will be previewing the new stamp sets everyday until the release on Monday - so be sure to check Claire's blog to see who's sneak peeking each day! Now you should go check out Lisa's sneak peek of the Roses set! 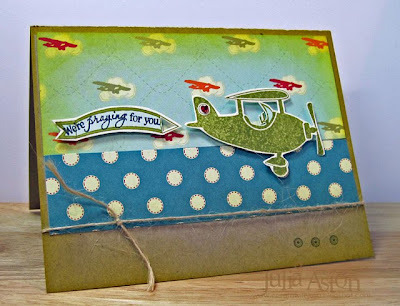 We'll be doing a New Release Blog hop on Monday - there will be stamp sets to be won so be sure to stop by on March 1!!! Accessories: dew drops, twill tape - SU, foam dimensionals, labels three Nestabilities, gold spica pen. 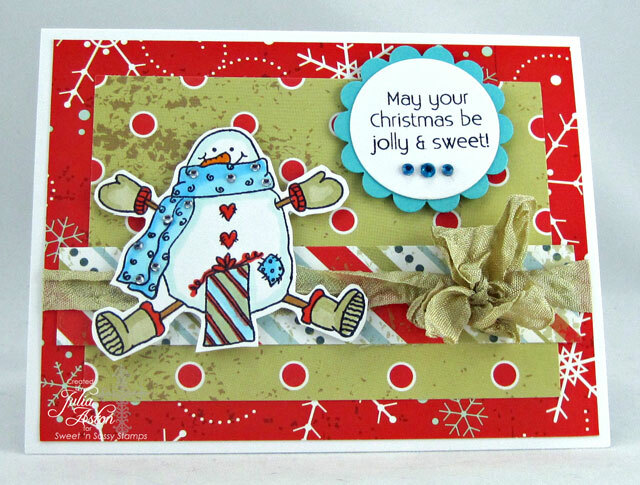 I made this card for the sketch challenge on Split Coast this week. I took a little liberty with it by not lining up my eggs in a straight column and I also added a ribbon. 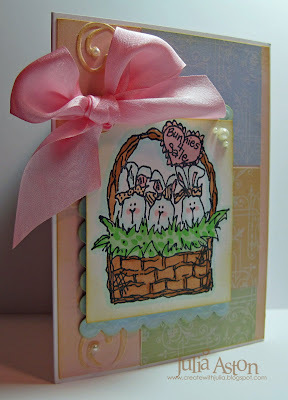 My eggs and sentiment are from a pretty new set called Spring Baskets from Waltzingmouse Stamps . The eggs are paper pieced and then colored a little with Copics. I used pinking circle nestabilities for the shape the eggs are layered on and I popped them up on foam dimensionals. 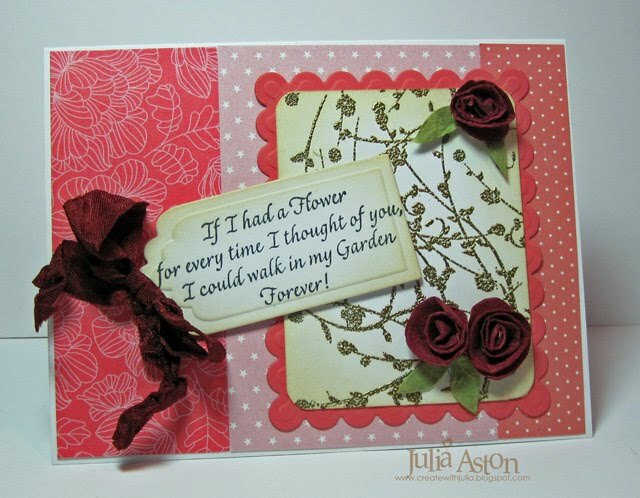 I made this card using this weeks sketch challenge at Split Coast. I turned the sketch on it's side to accomodate my pretty trees. 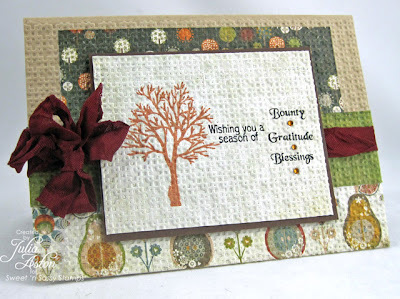 Can you believe how these Stampin Up Trendy Trees match the trees in this designer paper?! And did you notice the cute owls on the bottom piece? I just got this paper last week at The Papertree in Manchester, NH where I teach classes once a month. It's Dream St. Papers/Sam and the owl one is called Hoot-Hoot and the tree one is called Seasons of Change. One stamping thing I did do on my vacation was to practice coloring with my Copics - I brought a bunch of stamped Magnolia images, such as the Edwin above, with me to the cottage. So I had this cute little guy all ready for this Split Coast Sketch Challenge card today! I'm also taking a Copics class at the Papertree in Manchester, NH this Friday - so hopefully I'll learn some good techniques! I used the Argyle Cuttlebug folder on all the panels. The Edwin is cut out and popped up on foam dimensionals. The sentiment is from a set I've had forever called Classic Baby by Scraptrends. Inside I stamped a happy birthday sentiment. The papers are all Papertrey ink. Here's a hot tip!!! Claire Brennan is releasing 4 new stamp sets this Sunday, 8/9, check out her fun sneek peeks and a chance to win one of the new sets over at Waltzingmouse!! 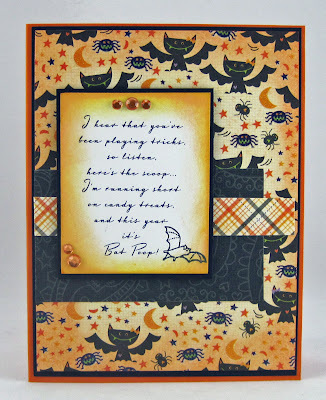 She's showing some really wonderful Halloween and Christmas Stamps!